From the burning plains of Balochistan to the top of K2, the world’s second highest mountain, Pakistan is the link between the steamy subcontinent and the wild mountains of Central Asia. Four of the great mountain ranges of the world collide in the North and the scenary is matched by an eclectic collection of people and cultures. The North is the area we know best and the area which, we think, holds most interest to visitors. Remains of the ancient buddhist civilization of Gandhara sit side by side with the sights and smells of the chaotic Pashtun capital of Peshawar. Walking on, around or up glaciers in the Karakorum, crossing rope bridges in the Pamirs and meeting isolated animist tribes in the Hindu Kush are just some of the things we pack into trips here every summer. 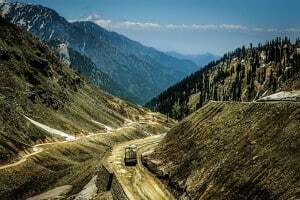 Access to these areas has been made easier since the building of the remarkable Karakorum Highway 20 years ago but it is still an unexplored and overlooked destination for anyone wanting to have some real adventure. However, the incredible scenery takes second place in Pakistan to some of the most hospitable and generous people in the world. Please contact us with any questions you may have. Taxila was once a major centre for both Hindu and Buddhist teaching from the 5th century BC to the 6th century AD. The area surrounding the modern town of Taxila contains more than a dozen archaeological sites containing Buddhist stupas and remains of monasteries and cities. 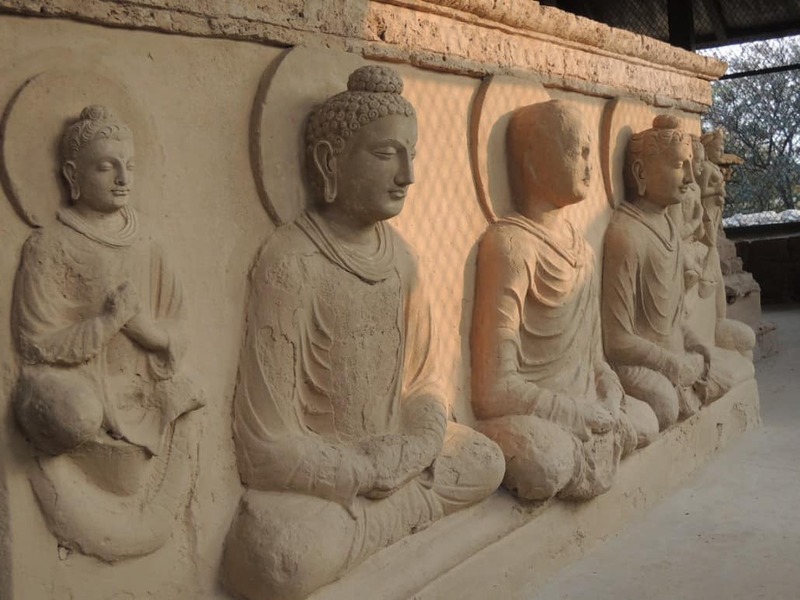 For many the highlight of their visit to Taxila is the small museum which contains fine examples of Greco-Buddhist art. Arguably the original East/West fusion when classical Greek sculpture style met Buddhist iconography. 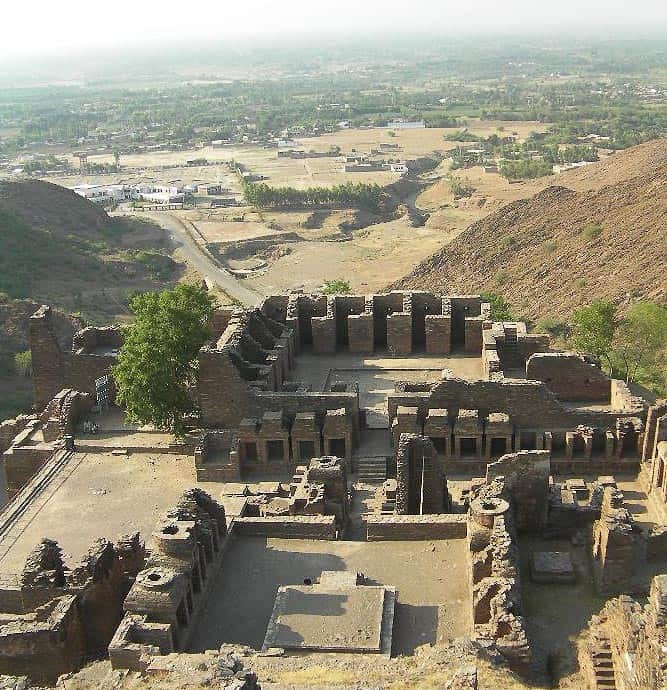 Takht e Bhai (throne of water) is a Buddhist temple complex that dates back to the 1st century BC. It is named after the natural spring that is situated very nearby and still used by the inhabitants of the area. Like both the Buddhas of Bamian and the remains at Taxila, Takht e Bhai was part of the great Gandharan Empire. With UNESCO world heritage status the complex is well maintained with the monastery being particularly well preserved. The setting at the top of a hill offer superb views down onto the plains of Peshawar and the Indian subcontinent beyond. The same views that the silk road traders were greated with as they finally finished crossing the mountains of Central Asia. Tahkt e Bhai is just one of many Buddhist remains in Northern Pakistan and we can arrange a specific trip to see crumbling stupas, edicts from kings carved in rocks and giant buddhas carved high on cliff walls. Just contact us for further details. Peshawar is our headquarters in Pakistan. The capital of the North West Frontier, just an hour from Afghanistan and only a short drive to the Tribal areas. The old city is a mix of the ancient and the modern. Mobile phone shops battle for space on the narrow streets next to ancient artisans selling textiles and jewellery. Storyteller Street contains tea shops that look like they and their owners haven’t changed since the days when Silk Road traders met and exchanged tales giving the street its name. Old Sikh meeting houses rub shoulders with mosques. Some are restored beautifully, some are in a state of disrepair. 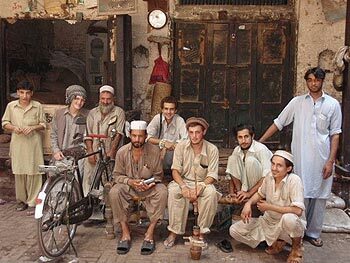 Peshawar is a great place to shop for souvenirs, rugs and carpets as much it is a great place to just sit and watch the world go by. The Peshawar speciality of Chapli kebab, basically a big greasy lamb burger, may not be to everybody’s taste but we are sure a cup of Kawa, sweet green tea, in an old city tea shop will suit everybody. Meat lovers will love the Tikka and Karai shops at Namak Mandi. Just order how many kilos of meat you want and whether you want it barbequed (tikka) or curried (Karai) and away you go. 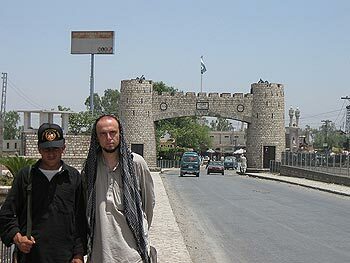 The classic invasion route to the subcontinent, the Khyber Pass has been used by everyone from Alexander the Great to the Persian Nadir Shah via Tamerlane, Babur and Mahmood of Ghazni. Of course, the British tried invading Afghanistan going the other way but twice ended up with a bloody nose. The winding road up through the Pass is flanked by forts belonging to the Khyber Rifles, the military unit that guards the Pass. The road follows the old train line that sadly is now falling into disrepair. Please get in contact with us for more information about the Khyber Pass. One of the two passes open to tourists entering Chitral. It is only open to vehicles for 6 months of the year and in May when the snow recedes bodies are often found of men who perished trying to pass by foot during the winter. The ride on the Chitrally side involves 42 hairpin bends as the road snakes down an incredibly steep road. Crossing the Lowari pass may not be a smooth ride but it sure is exciting. Long cut off from the rest of Pakistan and the world, the Chitral valley even today can only be reached by road for six months of the year. Even flying in is precarious as flights have to cross the mountains of the Hindu Kush. 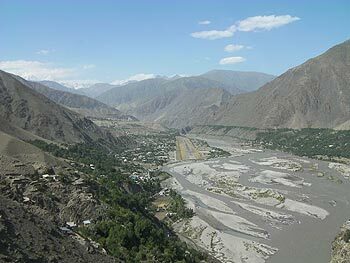 Chitral, the town is set on a river at the foot of Tirich Mir, the highest peak in the Hindu Kush. It remained a princely state until 1969 when it was absorbed into Pakistan’s NWFP although the Princes still retain a large influence in the region. Chitral Fort was the scene of a famous British victory when a small force withheld a seven-week siege during the winter of 1896 before a relief column battled through the snow-covered Shandur Pass to relieve them. Chitral is a beautiful town in its own right and is also a jumping off point to the magical Kalash Valleys. The roots of the Kalash are steeped in myth and legend. Many claim they are descended from the armies of Alexander the Great although some claim this was a more recent myth dreamed up by a Greek NGO worker. 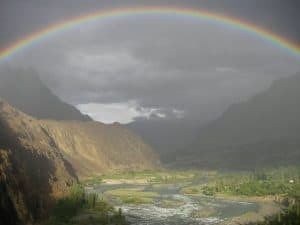 At one time their ancestors ruled all the way from the Panjshir Valley, north of Kabul, to Swat and Chitral in a land known as Kafiristan – literally Land of the Unbelievers. It was here that Rudyard Kipling set his famous short story, The Man Who Would Be King. But when Afghanistan’s eastern border was finally agreed upon in 1893 – cutting right through Kafiristan – the Amir of Kabul seized the opportunity to invade the land on his side of the border, convert the infidels and change its name to Nuristan – Land of Light. In what was probably the last forced mass conversion in history, Kafiristan was reduced to the lands of the Kalash. Surrounded by an ocean of Islam the Kalasha still worship their ancestral gods and hold colourful religious festivals of music and dance They drink wine, sacrifice animals and, even though the men now wear the standard Pakistani Shalwar Kameez, the women still dress in traditional garb; black dresses held tight round the waist with a thick red belts, flamboyant head-dresses made of wool, decorated with cowry shells, old buttons, beads and bells and, perhaps most striking of all, around their necks great strands of coloured beads. The Kalash divide the summer months between herding their goats in the high pastures and tending their crops of wheat and maize in the valleys. Apricots, mulberries and walnuts are collected and dried for winter while the grapes are made into wine. Many of our itineraries arrive in the Kalasha valleys in time to witness one of their traditional festivals. This is a great time to see the Kalasha traditions at their best. We have many friends amongst the Kalasha and ensure that our impact on their way of life is kept to an absolute minimum. The Shandur Pass is the second route into Chitral. As with the Lowari Pass, it is open only six months of the year and is a thrilling if slightly uncomfortable ride. 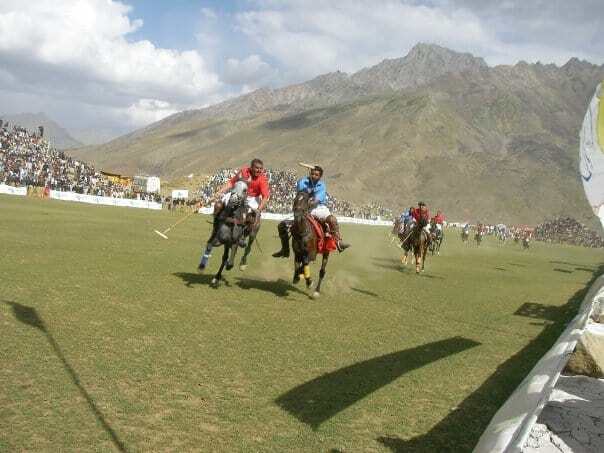 In July every year, the barren pass turns into a festival when Gilgit take on Chitral at freestyle polo. The rules are reputed to be 800 years old and the competition is as brutal as it is skilful. People come from all over Pakistan and the world to the three-day festival that sees various teams face each other during the day followed by music, dancing and optional drinking local moonshine in the evening. Thought to be the inspiration for the mythical Shangri La of James Hilton’s Novel “Lost Horizons” and more recently of “Spirited Away”‘s director Hayao Miyazaki’s animated film “Nausicaa of the valley of the wind”. 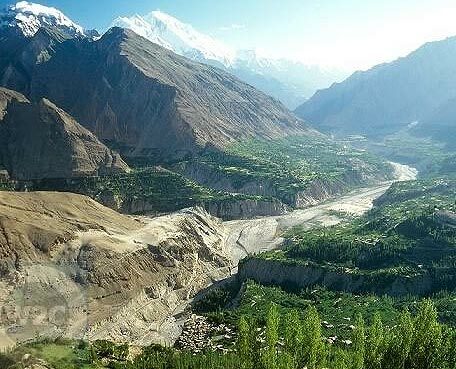 The Hunza valley has been astounding those that have managed to make it here for centuries. Until recently the valley could only be accessed by foot and only with the arrival of the KKH did Hunza become anything less than a formidable challenge to reach. Legend has it that this isolation led to the inhabitants living extremely long lives and even now most local people swear that their grandparents lived until at least 100. Until 1974 it was an autonomous princely state before being absorbed into Pakistan. The Mir of Hunza is now an elected leader rather than a hereditary one. The valley is surrounded by some incredible snow capped peaks. Rakaposhi, Ultar and Ghentar peaks all top out over 7000m and the incredible Bublimating (Ladyfinger Peak) rises so steeply that no snow can stick to it. We stay at the Eagles Nest Hotel that offers the best views of all of these mountains and the valley and conduct walks along the ancient irrigation channels that long ago changed this barren valley into the lush oasis it is now. AKA the KKH, the road took 20 years to build and was only completed in 1986. It is often described as the 8th wonder of the world and stretches over 1300km from Kashgar in China to Islamabad in Pakistan. It passes through some simply stunning landscape on a road that is nothing short of an engineering marvel. Whether it is passing within metres of huge glaciers, crossing over bridges or overlooking deep drops into the valley below, a ride on the KKH is always interesting. If you pass through anywhere in Northern Pakistan you will not be able to escape Pakistani tourism board posters of the view of Nanga Parbat from Fairy Meadows. The poster boy of Pakistan tourism is rightly famous. From the Karakorum Highway it is a 90 minute bowel emptying jeep ride up a road clinging to the side of the valley and built entirely from dry stone cantilever bridges without the use of any cement or modern building materials. Once the road stops it is a 2 hour hike up to a small pine covered valley and the Fairy Meadows campsite complete with views of Raikot glacier leading up to Nanga Parbat and some huts for those who don’t like to camp or are part of an Untamed Borders trip. 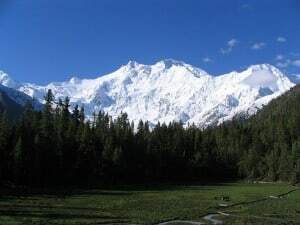 Nanga Parbat, the Killer Mountain. At 8125m it is the worlds 9th highest mountain and the only 8000+ metre peak that you can walk to the base camp of in one day. It marks the western end of the Himalayas in impressive style. Heinrich Harrer came here to climb it in the late 1930’s but he was imprisoned by the British before escaping to Lhasa for his “7 years in Tibet”. Due to its relatively southern position in the Himalayas it suffers from unpredictable whether during the monsoon and it’s proneness to avalanches gives it a fearsome reputation in the climbing community. The mountains Rupal face is the world’s longest continuous mountain face in the world stretching to a height of over 4500m. 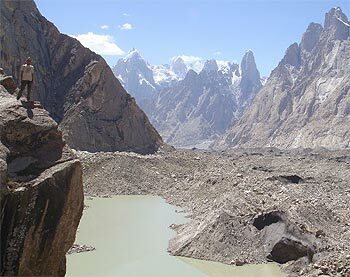 The hike to Concordia is possibly the most spectacular in Pakistan. A country not short of incredible mountain scenery. 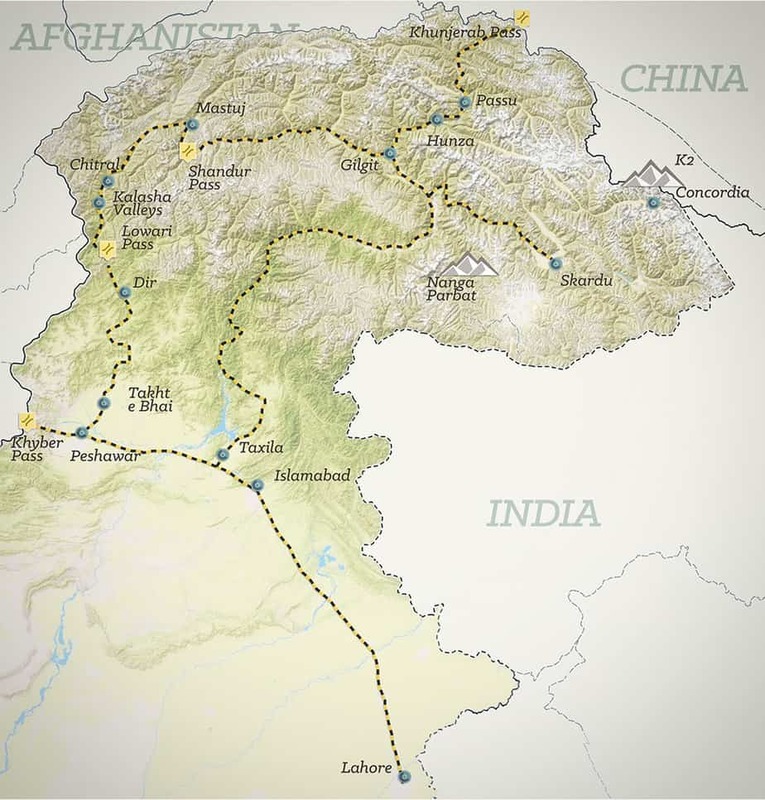 The route we take follows a 14 day round trip trek through uninhabited areas. Much of the route involves walking and camping on the Baltoro glacier, at 62km long one of the worlds longest outside of the South Pole. As you pass up the glacier you will pass incredible rock formations like the Trango Towers, the world’s highest cliff faces, and the Cathedrals but these giant mountains seem small at Concordia where 4 glaciers converge and seven of the worlds 25 highest mountains come together in the greatest concentration of high mountains on earth. The Gashumbrums 1-4, Broad Peak and the great pyramid of K2 all rise in the space of 20km. Any trip we organise would allow a couple of days for visits to the base camp of K2 and Broad Peak before crossing the Gondogoro Pass (5900m) back to civilisation. The walking is strenuous and the walkers will need to be in good shape but most of the altitude gain is gradual. Please contact us for a full supported trip with experienced guides. Located on the Chinese-Pakistan border, K2 has is known as the mountaineers mountain. Access to base camp is not easy and involves a 6 day hike in from the nearest village. When viewed from Concordia it rises like a giant pyramid of Rock and Snow. The world’s second highest mountain is less climbed than Everest but comes with a fearsome reputation. In 2008, 11 climbers died after an avalanche left them stranded at over 8300m. 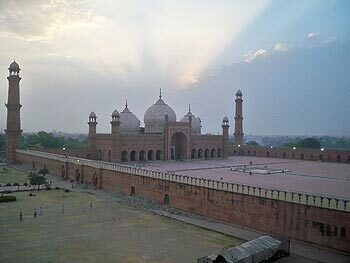 Lahore is one of Pakistan’s most liberal and cosmopolitan cities with a rich Sikh and Mughal heritage. The city is a vast teeming metropolis with the Fort, Badshahi Mosque and Shalimar Gardens standing as living reminders of the Mughal era. It is regarded as Pakistan’s city of culture and it easily lives up to this reputation. Whether it be visiting the colonial museum, starting point of Rudyard Kipling’s “Kim”, or listening to devotional Qawalli or mystical Sufi music we can point you in the right direction. 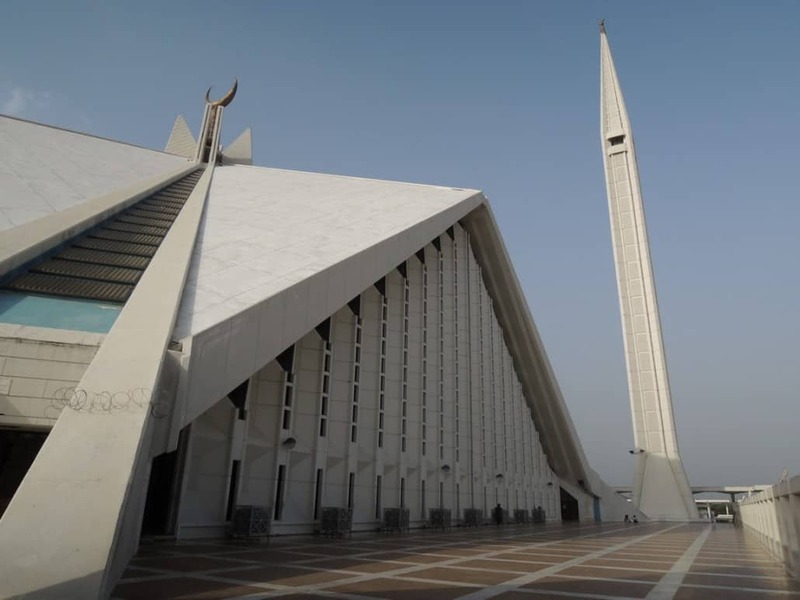 Pakistan’s capital was only designed and built in the 1960’s. It does not have any history and for many the grid layout and wide boulevards are more reminiscent of a US suburb than the sub continent. None of our itineraries hang around too long here but if you are after a few home comforts after a trip to the wilds of the North or to Afghanistan we know where you can get a steak, a beer or even a visit to Pakistan’s only anti-fascist ice cream parlour!! Untamed Borders is one of the most experienced adventure travel companies working in Pakistan and hold an office in Peshawar. We regularly organise tailored trips in this fascinating country. Please get in touch for more details.